09-Nov-2007 -- Continued from 32N 24E. We went further south and crossed the silica glass area. 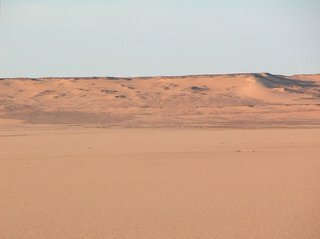 At the southern tip of the silica glass area we turned left and started to cross in north-eastern direction about 35 sand dunes of the great sand sea running north to south. At the ammonite scarp we turned south to Regenfeld and then east in direction al-Dākhila. We were about 30 km northwest of the confluence point. Since we were the only confluence "hunters" in the group, we explained what we wanted to do. The biggest motivation for the group to get with us to the confluence point was that this point was not visited by anyone else before. Thanks to this CP we came along a beautiful landscape with many small hills and rocks in all possible colours. The lower the sun sank, the more spectacular it became.